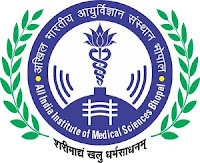 All Indua Institute of medical sciences know as AIIMS Required Sisters in grade-II for the department. Matriculation or ab-owe from a recognized University / Board. Certificate in General Nursing and Midwifery from a recognized Institution or equivalent qualification for male nurses. Should be a registered ‘A’ grade Nurse and Midwife with a State Nursing Council or equivalent qualification for male nurses. Application filliping start from 15-07-2013. Last date of apply 05-08-2013. Last date of fee disposit 05-08-2013. Date of exam 25-08-2013 (Only for delhi). Date of results declaration 05-09-2013. All the original certificates/documents will be verified at the time of Interview.